Deep under the waves in the depths of the realm of the Sea-King, designer Serge Soudeikine created a world of whimsical creatures that brought the Russian opera, Sadko, to life. The opera, written by composer Nikolai Rimsky-Korsakov, follows the journey of a guslar (Southeastern European stringed instrument) player named Sadko, and ultimately provides a parable for the creation of the River Volkhova that links Lake Ilmen and the sea. The U.S. premiere of Sadko (performed in French) opened at the Metropolitan Opera house on January 25, 1930. Sadko received eleven performances that season and ran for another nine performances in the subsequent two seasons. 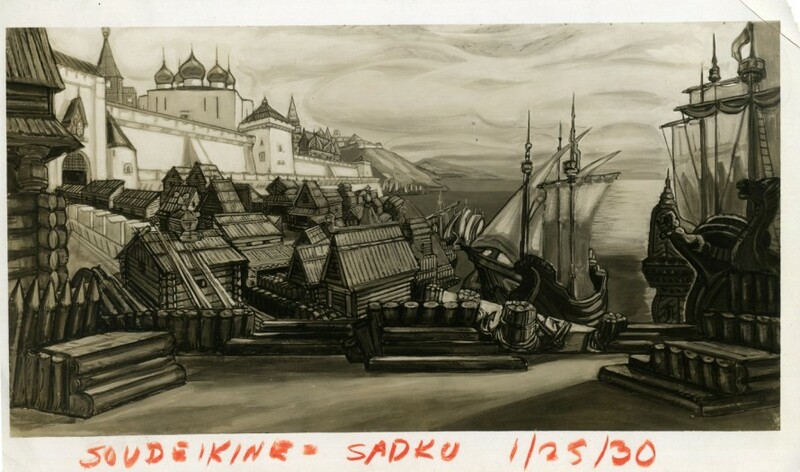 Soudeikine designed both the sets and the costumes for all of these performances. Soudeikine’s design depicts a red-bodied and green-tentacled squid costume with orange, green and blue dots. A figure with raised arms, stockinged feet and a green headdress is visible through the superimposed squid. Likely the Squid Costume would have been part of the scenes taking place in the palace of the Sea King. The protagonist, Sadko, has won the approval of the King and Queen with his singing and is awarded the hand of their daughter Volkhova. During the lively wedding celebrations that follow, there is a Dance of the Fishes as well as a dance of the Denizens of the Sea both of which may have featured the squid. Before being expelled for creating obscene drawings, Soudeikine studied at the Moscow School of Painting, Sculpture and Architecture. He developed his artistic aesthetic as a member of the Mir iskusstva movement in Russia. His work is rooted particularly in traditional folk art and incorporates playful and grotesque elements rather than focusing on the solemn or emotional. After a brief stay in Paris, Soudeikine immigrated to the US in 1922 and lived in New York for the remainder of his life. He was a prolific designer and produced many costume and set designs, including the Tony Award winning sets for the Broadway musical Porgy and Bess in 1935. 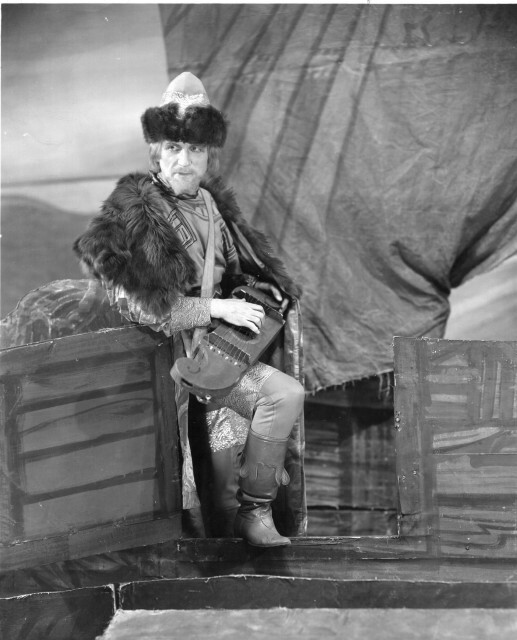 Two of his set designs, as well as a photograph of the character Sadko wearing Soudeikine’s costume (pictured below), are provided courtesy of the Metropolitan Opera Archives. Drawing, Squid Costume Design for the Opera "Sadko" by Rimsky-Korsakov, ca. 1929. Designed by Serge Soudeikine. Museum purchase from General Acquisitions Endowment Fund, 1984-65-2.